Good morning, dear readers! 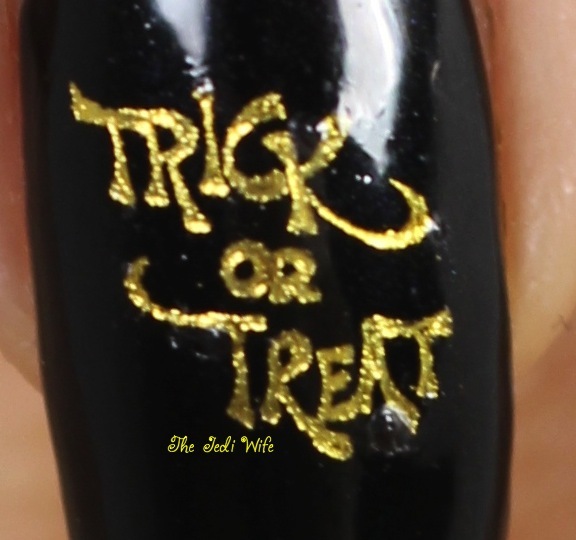 For today's blog post, I wanted to share some cute metallic Halloween water decals from Born Pretty Store with you. Now, before you say "Jen, are you crazy? It's still September!" let me explain the method to my madness. 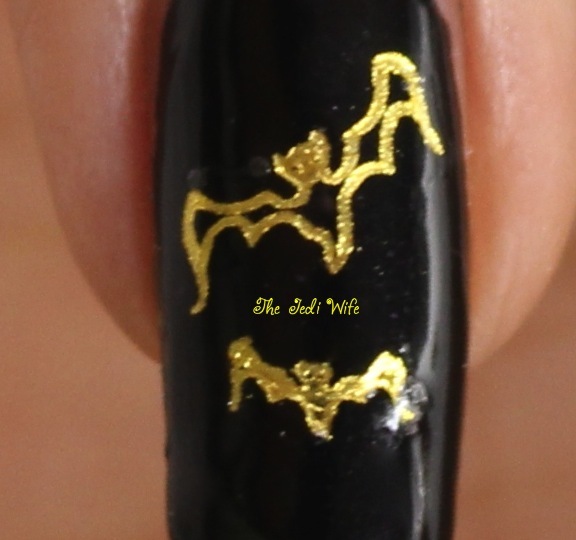 Yes, the middle of September might be early to be thinking about Halloween nail art, but I wanted to show these to you now in case you wanted to order some for yourself. Shipping from Born Pretty Store can take anywhere from two to five weeks, and if you order now, you shouldn't have to worry if they will arrive on time for use this year. I received the gold version to review, and there is a silver one with identical patterns. The ruler on the left side of this photo is using the centimeter scale bar for approximate size reference. I first painted my nails with the base colours and designs I wanted in the background. I then cut out the decals and peeled off the plastic film covering them. Using tweezers, I dipped the decals into warm water for 20 seconds. Usually this is plenty of time for the decal to float off of the cardstock backing to be picked up and then placed on a damp nail using tweezers, but this particular set did not want to budge easily from the backing. I soaked for an additional 20 seconds (40 seconds total), and using a finger, gently slid the decal off the cardstock and onto my tweezers. 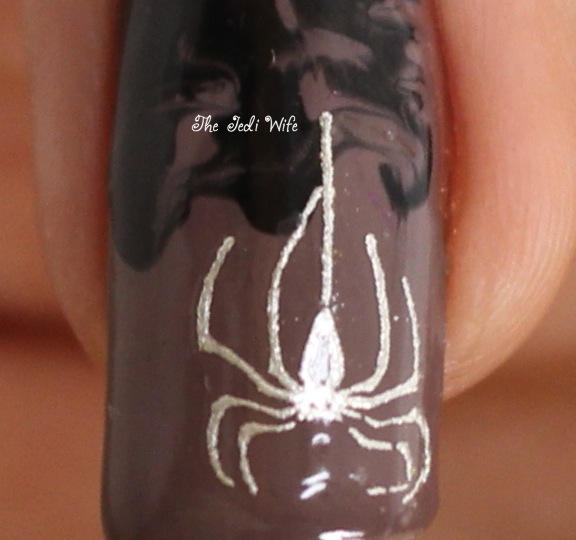 I dipped each nail in water immediately prior to placing the decal on the nail. 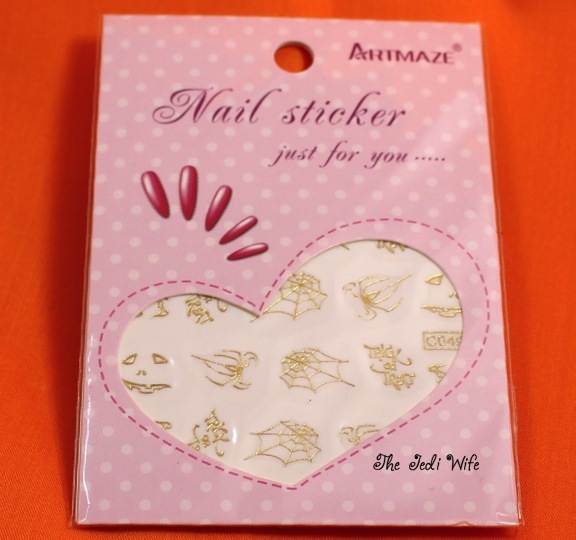 The decal adheres loosely to the nail initially, and you can shift it around slightly if you need to adjust the image. I then blotted up the excess water and then topped my nails off with top coat. Check it out, the spider is silver! More details on how that happened further down! These decals are really cute, and I love how this came out! The sheet is available in either gold or silver tone. Something interesting that I discovered is the gold decals are silver on the backside, so you technically have more options with one sheet if you put the decal on backwards. Obviously the "trick or treat" may not be the best decal to put on backwards as it would no longer be readable, or maybe you can wear it backwards in an awesome Shining-inspired costume. REDRUM perhaps? I'm definitely planning on using these decals again when it gets closer to Halloween! 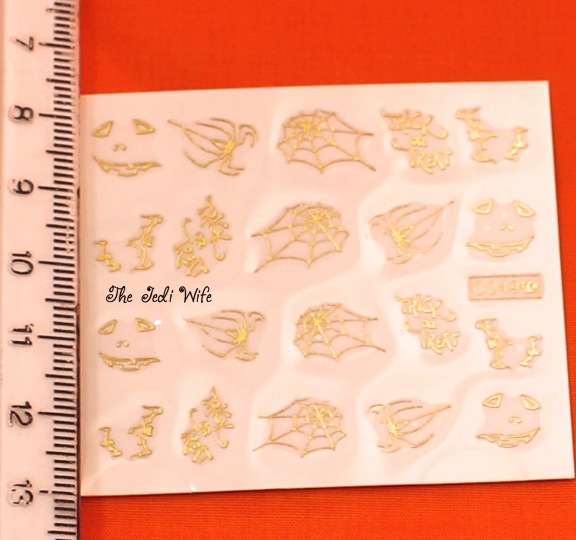 To purchase your own set of Halloween decals, please visit this link. While you are there, check out Born Pretty Store for your other nail art needs. You can also save 10% off your order by using discount code QWL91. 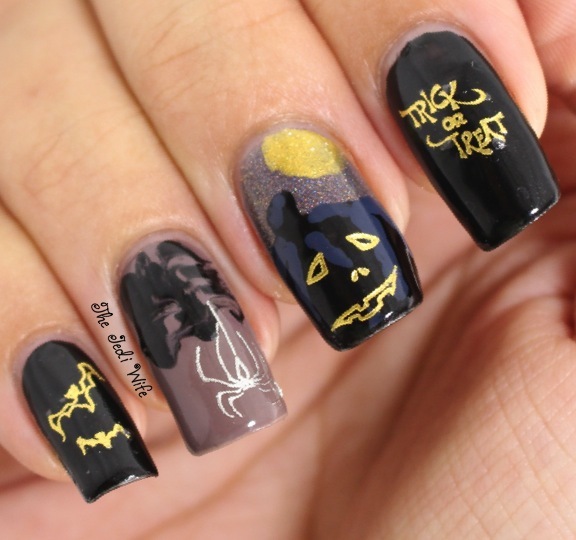 Have you started thinking about Halloween nail designs yet? I'd love to hear what you're planning! I am so excited for Halloween, I can't hardly stand it! 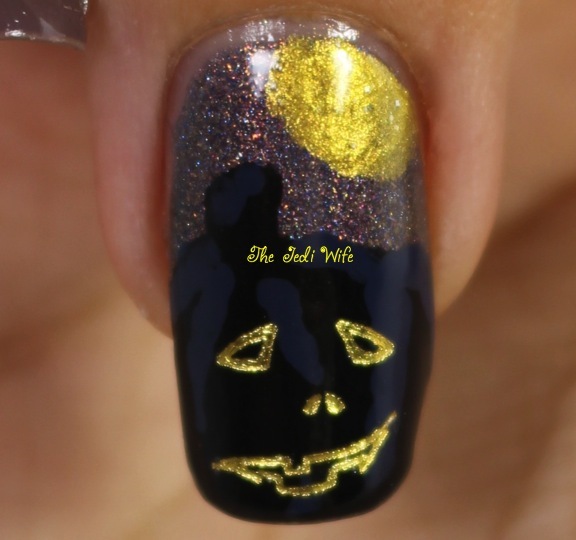 I'm going to be doing my first Halloween nail art look today. :) These decals are super cute! !